Just as there are laws in nature that hold our physical world together, so there are laws for life that make our spiritual walk a success. This book is Selwyn Hughes' legacy to future generations and essential reading for anyone who has been inspired by his teaching and ability to apply God's Word to everyday life and relationships. 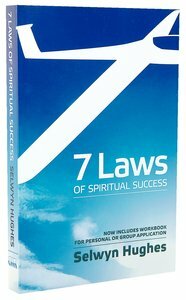 About "7 Laws of Spiritual Success"
In his mid-seventies, the author looked back over his years of experience in counselling and pastoral work as well his own walk with God and asked, "What have I learned in that time that I want to share with the next generation." He found 40 or 50 concepts that he thought would be worth writing about but in the end he condensed these down to just seven seven spiritual laws which he believes operate for every man and woman and for every generation.